If you’ve done any type of search from your mobile device on Google, you may have noticed a small AMP symbol showing up on some search results. We’ve been getting asked lately, “can we make our RV dealership website AMP capable”? Great question … let’s dive in. What is Google AMP exactly? Since 2015 they have added more capabilities to the AMP code format such as images, ads, and other elements, however, it’s still less than two-year-old technology and continuing to develop. Why did Google create AMP? The jury is still out on this one. Is it because they wanted to make the web faster? Or because they wanted to stop ad blockers from hurting their ad sales? Or some combination of both? What are the Pros of AMP? Pages load faster because they are static pages. AMP page search results may show up in the Google SERP carousel if you have enough competition. What are the Cons of AMP? You have to create and manage a completely different version of each web page you want to be AMP. All requests have to be in https secure format, requiring an SSL web site certificate and implementation. You are restricted to using only the EXACT page code elements that the AMP code allows which will limit your design and look of your pages. Your AMP web pages are NOT actually hosted on your current website. A copy is made of your AMP page and hosted on Google’s servers. The challenge with this is any link made to your AMP page will NOT link back to your own website and provide any domain authority or credit to you. Analytics will become more challenging as now you will need to view your AMP traffic separately from your current website traffic due to your AMP content being hosted on google.com, not your own website. AMP pages are mostly cached … it’s part of what makes them load faster. In the case of AMP, caching is a way of making a copy of a copy of your AMP page to load up and deliver to a website user. There is little doubt that on an AMP page, there will be delays in making pricing changes to a page and having it update in real time for a visitor/shopper. How are other ‘in the know’ commerce and lead gen websites using AMP? 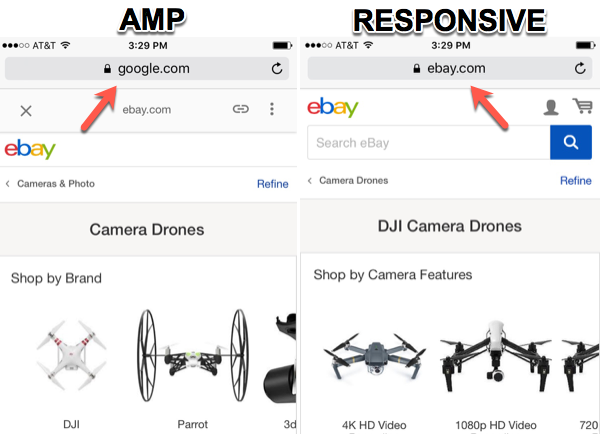 This part of our research was very revealing in that AMP is being used by sites such as ebay.com, but NOT in the way you might think. They are only using AMP as doorway pages to their main site, which is exactly how Google does NOT want AMP to be used. It’s trickery and based on past attempts at playing games with Google, it probably will not turn out well for them in the long run. As you can see in the example below the AMP page is hosted on google.com and literally just has images/links to the ebay.com responsive page hosted on ebay.com which actually has all the information and functionality needed for a consumer to discover and engage. Essentially, these sites are creating additional category listing pages in the AMP format, that then link back to their normal website for the actual unit/product information pages. If AMP worked so well to speed up all pages, why not have AMP versions of the product pages that actually have the real information on them … it’s our assertion that AMP pages have limited SEO value and consumers are not easily engaged on AMP product specific pages due to all the cons provided above. Doesn’t AMP help me rank better in Google searches? AMP is not directly a search engine ranking factor, and sites that adopt AMP won’t “get a massive boost in search ranking,” according to Richard Gingras, senior director of news and social products at Google … “All of the other (search engine ranking) signals need to be satisfied as well,” he said. All InteractRV mobile responsive RV dealership websites have been optimized for mobile and as of this posting were the fastest of all the known competition that was tested. What would it mean to create an AMP website for your dealership? Essentially, it would require building a different version of your website. Every existing page such as .com/about-us would have to have a new version created such as .com/amp/about-us. Can some of this be done through the CMS? Sure, but now every page change would have to be tested using the AMP validator tool. All unit/product detail pages would be handled dynamically, but it would still require a custom template with NO to very little customizations. Won’t this take more time, resources, and money? The simple answer is yes. AMP cannot do what you want for shoppers on desktops, laptops, and tablets, as it is really best designed for content publishers (ie news sites) targeting mobile phones. This will require a near identical version of your site with limited control. Can I build an AMP version of my rv dealership website? Most anything is possible and creating an AMP version of your website is no different, it can be done. I think the better question to ask is does it make sense to do it? As with most business decisions, they should be based on reasonable ROI … the defining factor here is are your competitors currently showing up higher than you in mobile device searches? If they are, then AMP might be a tool to help you rank higher than them, but not necessarily so as we learned above. The primary reason that AMP was created was that they knew it was easier for the average website creator to just create an additional ‘slimmed down’ version of their site vs having to actually improve and test their existing mobile responsive site to make it super fast for mobile. Is my site faster than my competition? You can learn more about testing rv dealership speed here. Are my mobile rankings falling? When your website is slower than your competition or your mobile search rankings are falling, then it might be time to pursue AMP. Until then, we will keep an eye out for any significant AMP changes and report back to you when and if they occur. As always, it’s a privilege to serve you with your web and digital marketing efforts. Feel free to reach out to your Customer Success Specialist with any questions at 800-515-9672.